During the 1mCHW Campaign’s ICT for Health conference in June 2016, The Millennium Promise Alliance (MP) and Kuapa Kokoo Farmers Union (KKFU) signed a partnership agreement to improve the health and wellbeing of cocoa farmers in six regions of Ghana. In her speech at the conference the KKFU’s President, Madam Fatima Ali, spoke of the many successes of the KKFU including increased participation of women in decision making, environmental sustainability, and an increased market share. Despite its successes, the communities of the KKFU face critical challenges, such as low socio-economic status, inaccessible roads, limited or no access to electricity, little formal education and inadequate health care facilities. To mitigate these challenges, KKFU seeks to partner with MP to strengthen health systems, tackle climate change conditions and agribusiness. The partnership seeks to strengthen the KKFU’s existing health system by bridging the gap between remote communities and central health clinics through tele-consultation centers and mobile clinics. 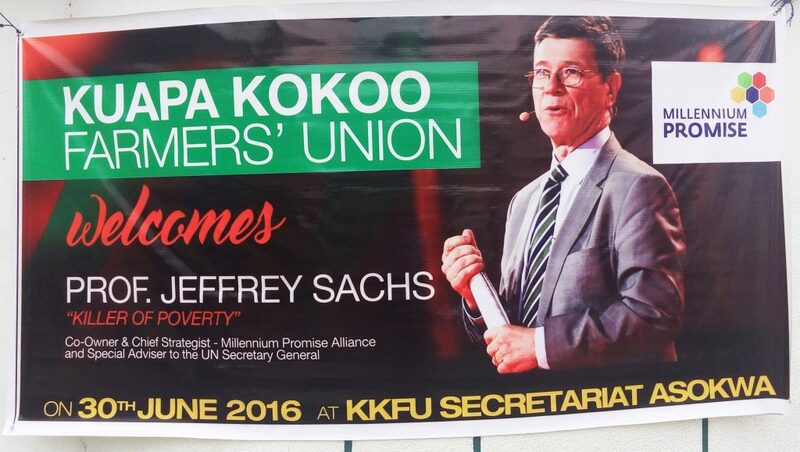 The agreement was signed by Professor Jeffrey D. Sachs, Special Advisor to the UN Secretary General and Founder of MP and Madam Fatima Ali, President of KKFU.